Camping season is coming and spending time outdoors I am so excited except I am a chicken when it comes to wildlife such as foxes, coy dogs, skunks, and porcupine. I was recently given the opportunity to review at lantern which will come in handy these upcoming outdoor nights to see where I am going. BYB LED Camping Lantern which is created to function as the ideal item for anybody looking for a high-quality option that will last through the years. Powered by 3 AA batteries (not included) Functions either as a space filling lantern or as a fine flashlight depending on whether the frosted globe is slid up or down Max output is 300 lumens. Height 8.15", weight: 258g Designed to be hung high up with the hanging loop to lighten the room Durable base with extendable. This lantern has a five-year warranty and lifetime maintenance. 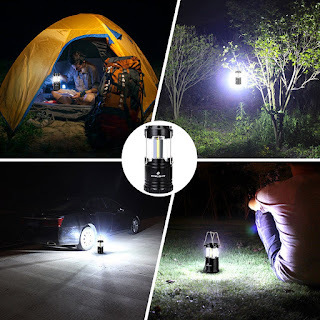 My Opinion: I like the size, it is collapsible and how light it is to carry very impressive and because it is LED it is very bright and although it runs on batteries it is perfect for camping as there is no electricity anyways. I can see a very far distance away with this as well.